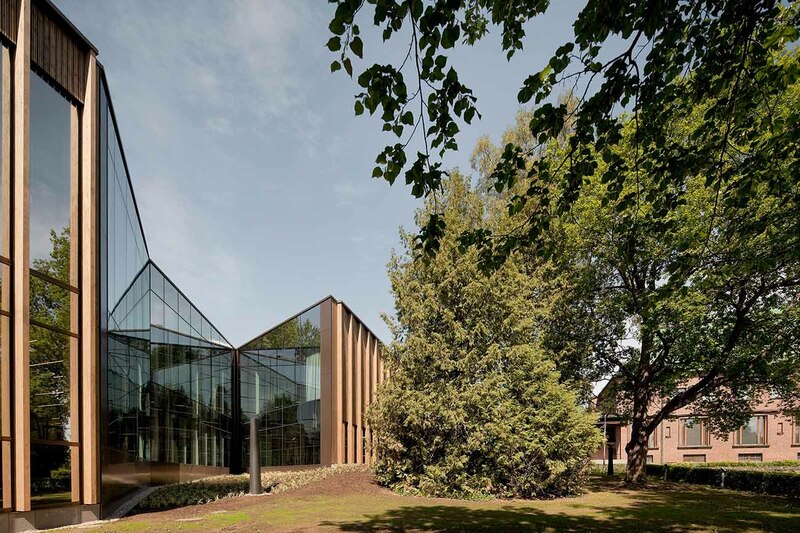 The new Contemporary Art Museum Gösta Serlachius in Mänttä, Finland, was designed by MX_SI, winners of the international open competition in 2011, organized by the Foundation Serlachius with the support of the association of Finnish architects SAFA. 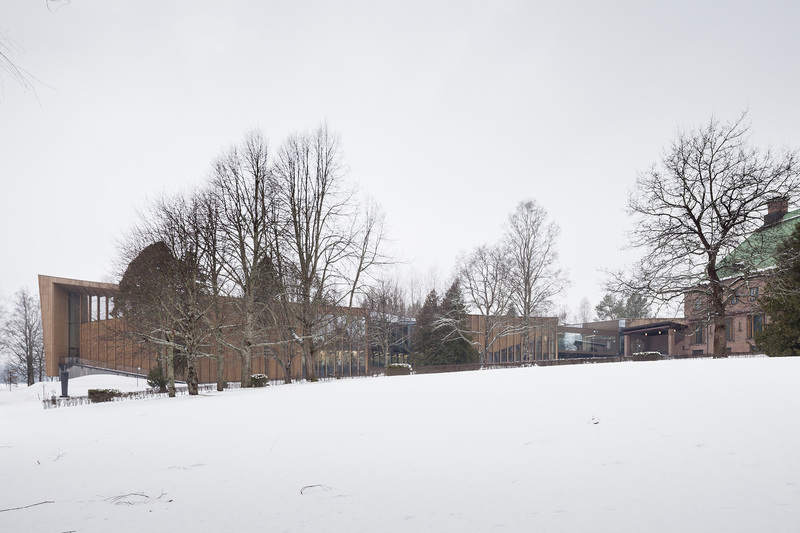 As a starting point, the place is understood as a large green canvas with the imposing monolithic figure of the Joenniemi Manor House at its highest point. 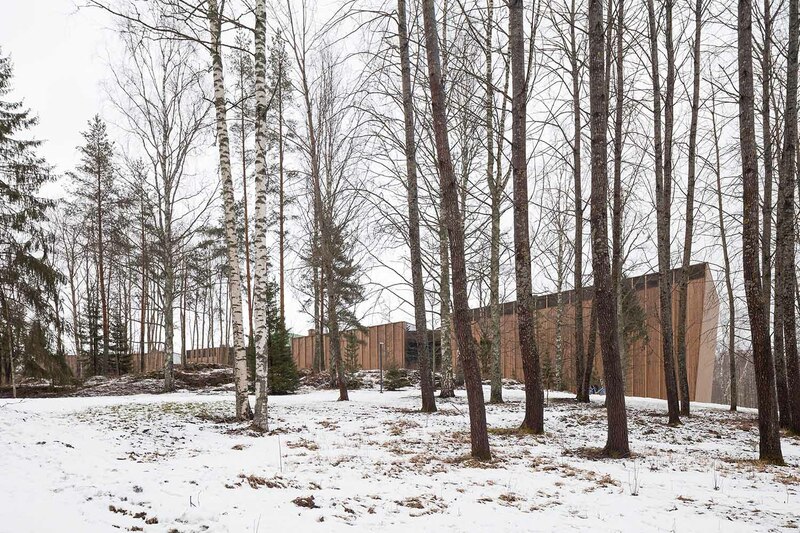 A landscape which together with the old house comprises a heritage with cultural significance for the citizens of Mänttä and the Serlachius family. 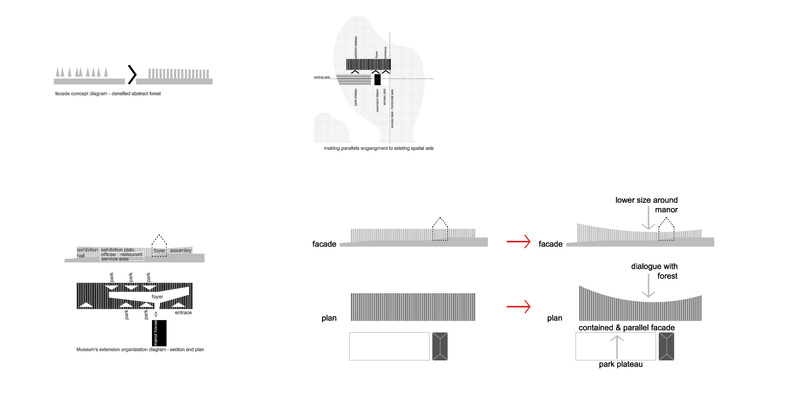 The project strategy is to establish a dialogue between the new and the existing by positioning the new construction so that Joenniemi continues to take centre stage, and at the same time the new museum does not lose the opportunity to express its character and contemporary presence. 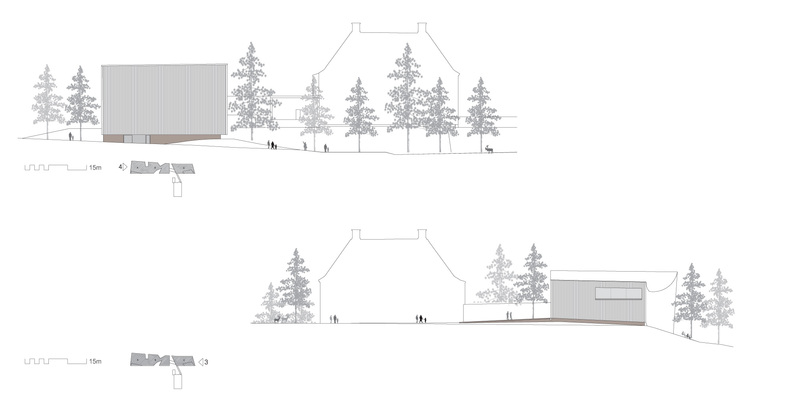 The solution was therefore to arrange the new volume parallel to the axis established between the house, the garden and the lake. 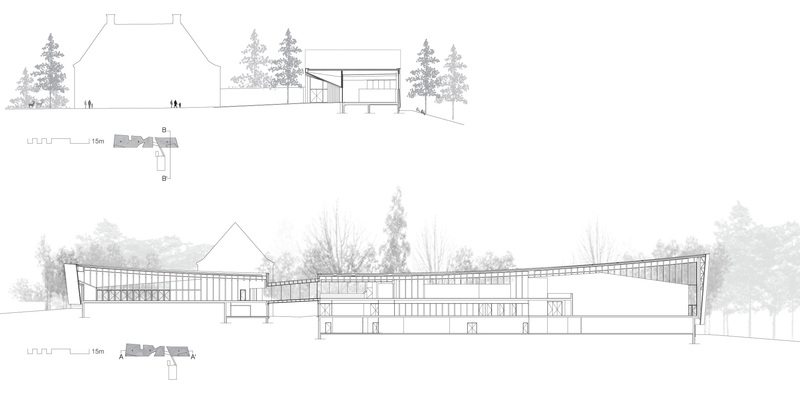 An access plaza to the building was created, where the Joenniemi building continues to dominate the vistas of the area, and as the land descends and approaches the lakeside the new building becomes higher and more prominent. 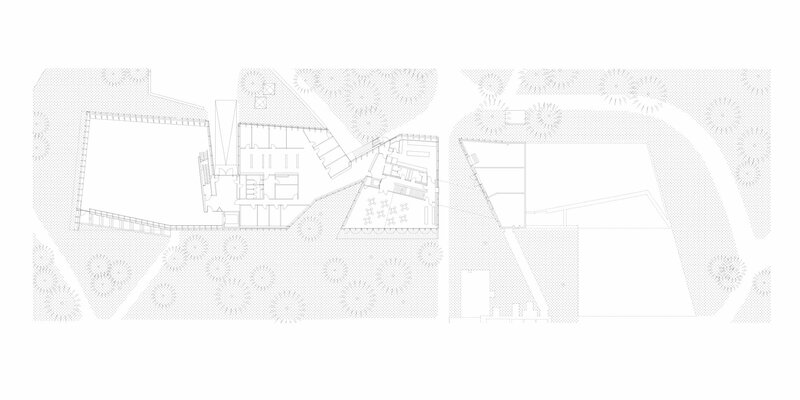 The project is conceptualized as an abstract and dense forest. 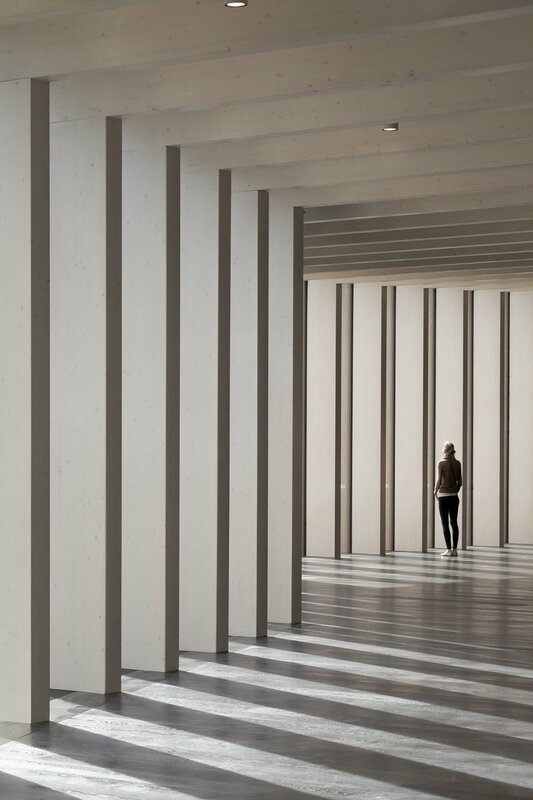 A forest that represents and translates into a series of parallel wooden frames that define the geometry and structure of the new building. 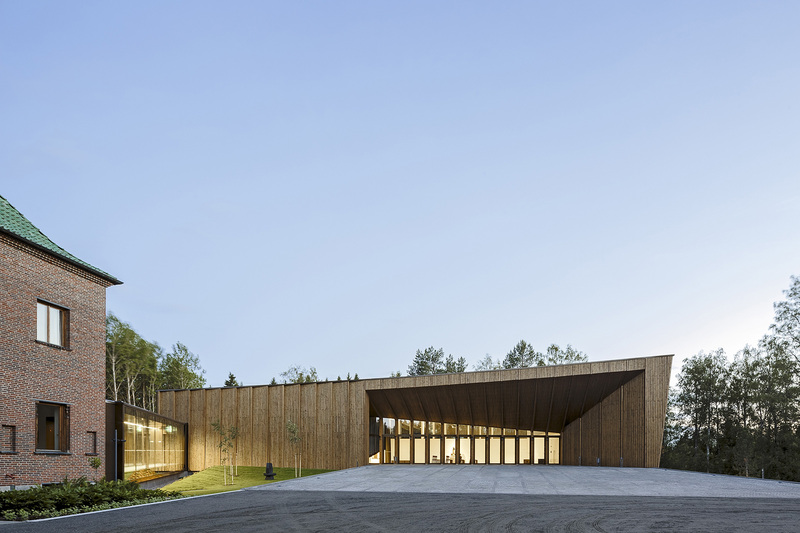 The structural framework is constructed with laminated spruce wood as it is abundant in the area and in turn makes an historical reference about the local industry. 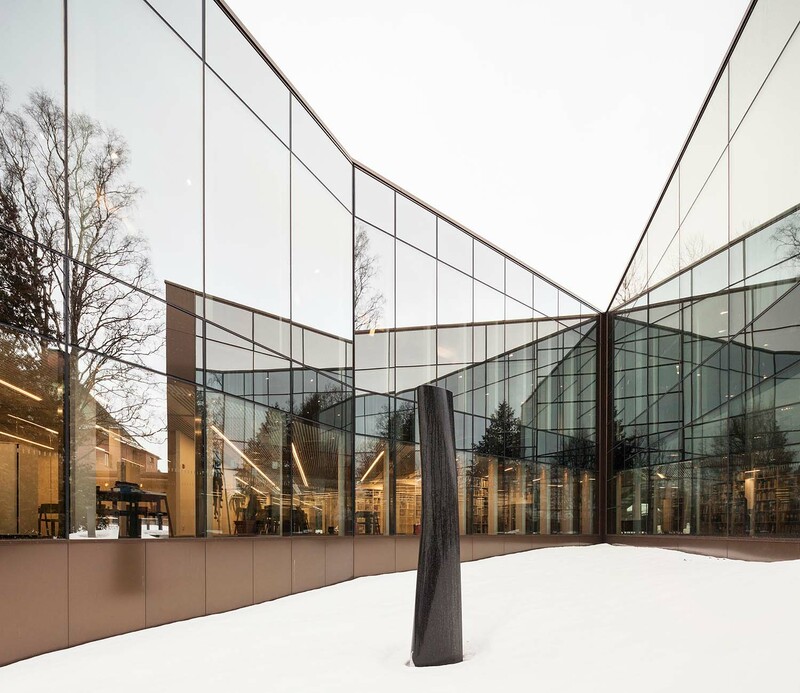 On the outside, the building presents a series of vertical mullions that follow and emphasize the rhythm of the interior structure. 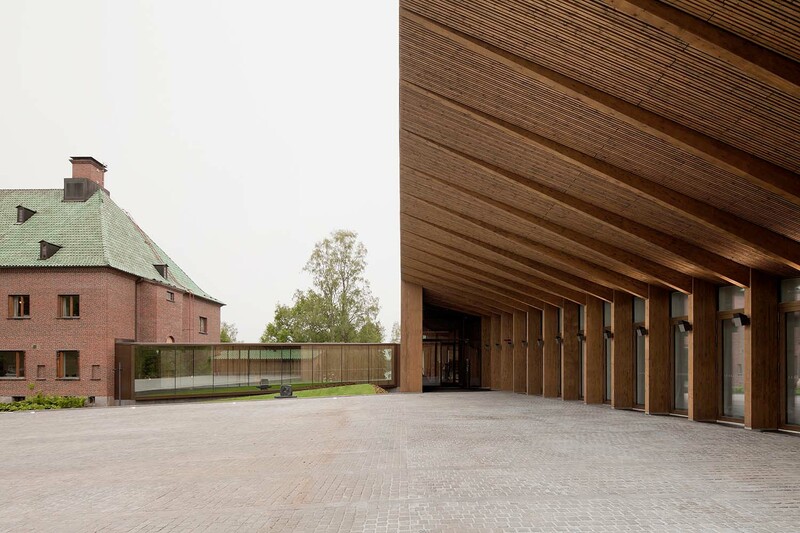 Between the mullions a ventilated façade system was designed of spruce wood strips twisted independently to the tectonic limit of the material itself, thereby achieving an effect of a three-dimensional texture that varies along the entire elevation. The façade idea also considered the effect of time on a living material like wood, so it was decided to add a semi-transparent golden hue to all its elements. 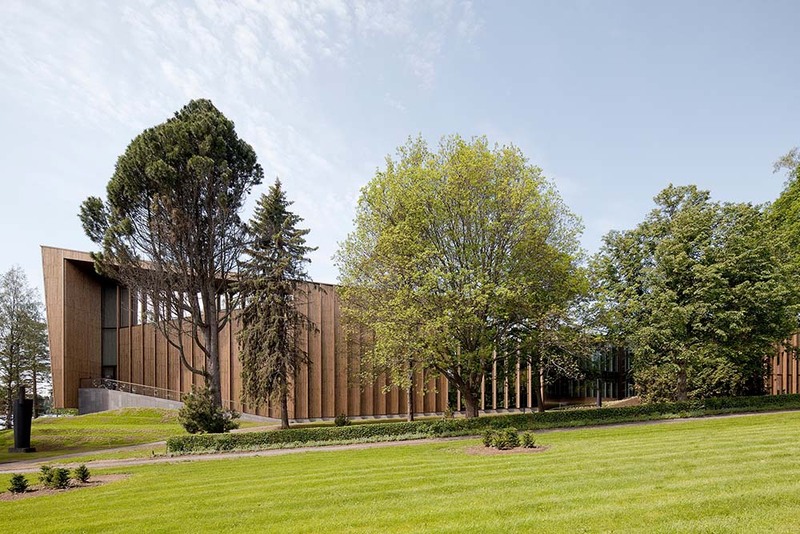 During the first years the building will thus maintain a consistent image that will fade to make way for the desired silver tones that characterize this wood as it ages. 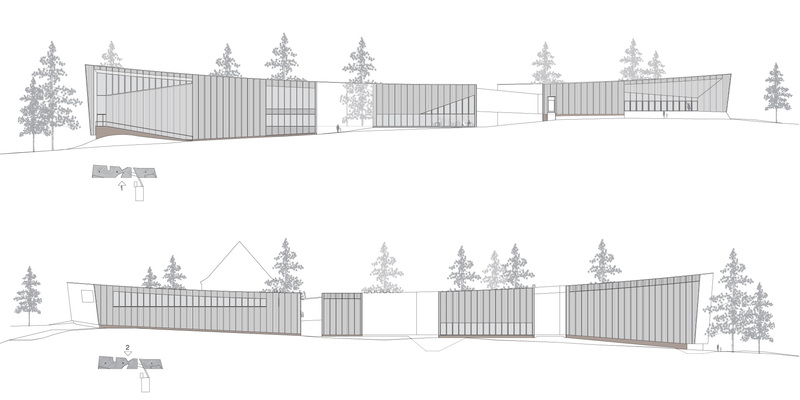 To reduce the visual impact of a building in such a sensitive environment, the building seeks to decompose into smaller fragments. The volume is interrupted by certain cuts, or irregularly shaped incisions, which are covered with a reflective glass surface. 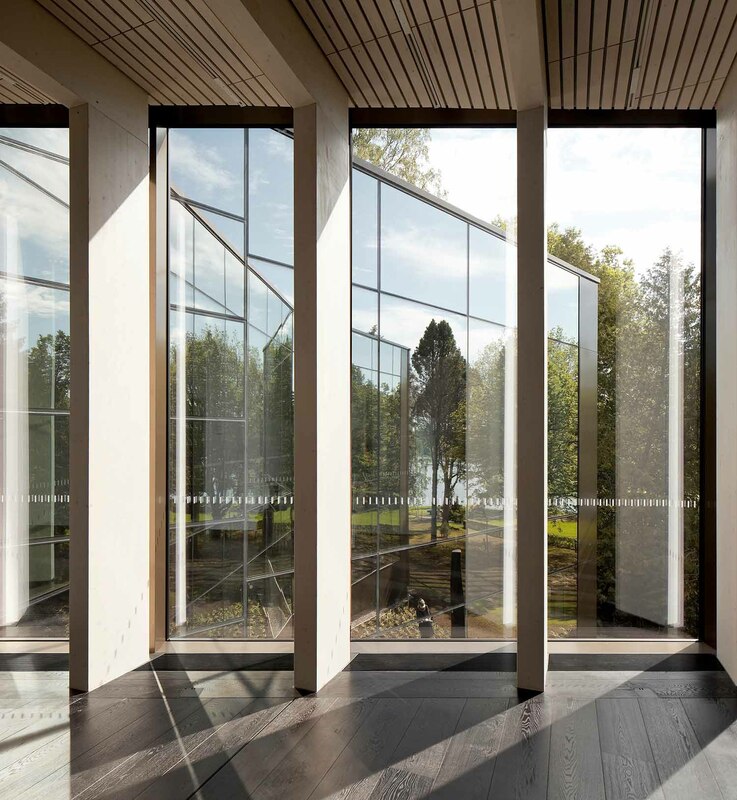 The result of these incisions is the perception of spaces of infinite mirrors; doors or forest walkways optically subdividing the building transversely. 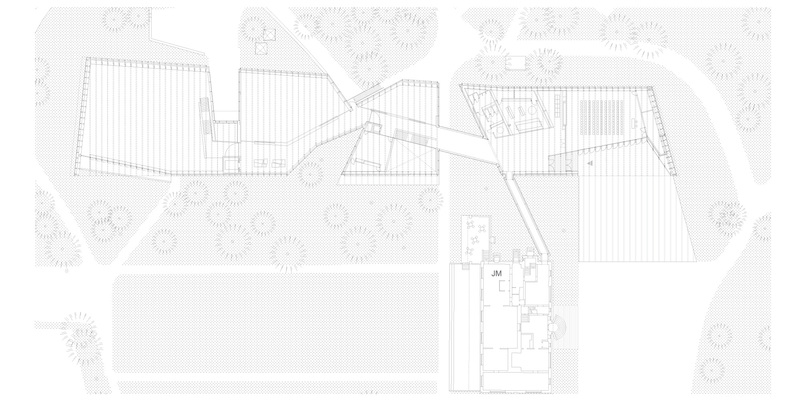 Inside, the building is organized to continue with the path which starts from the outside. This path is crossed by a sudden and surprising invasion of light caused mainly by the incisions in the volume of the building that also offer exterior views. 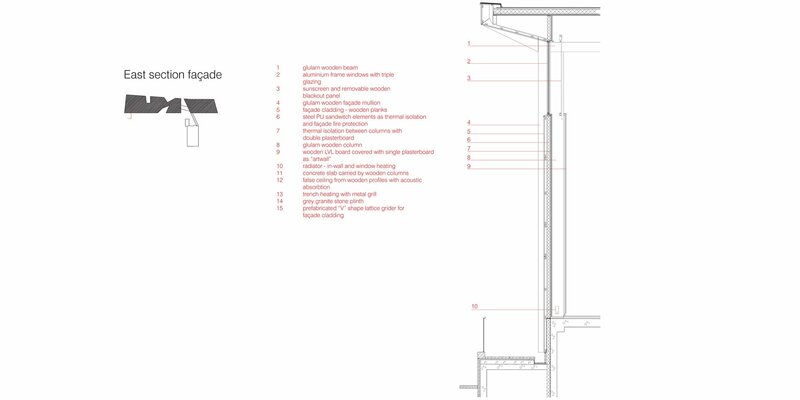 These invasions transform what would have been a lineal path into an emotional one, thanks to the rhythm of the constant repetition of the structural frames and interruptions that allow external spaces to penetrate inside the building. 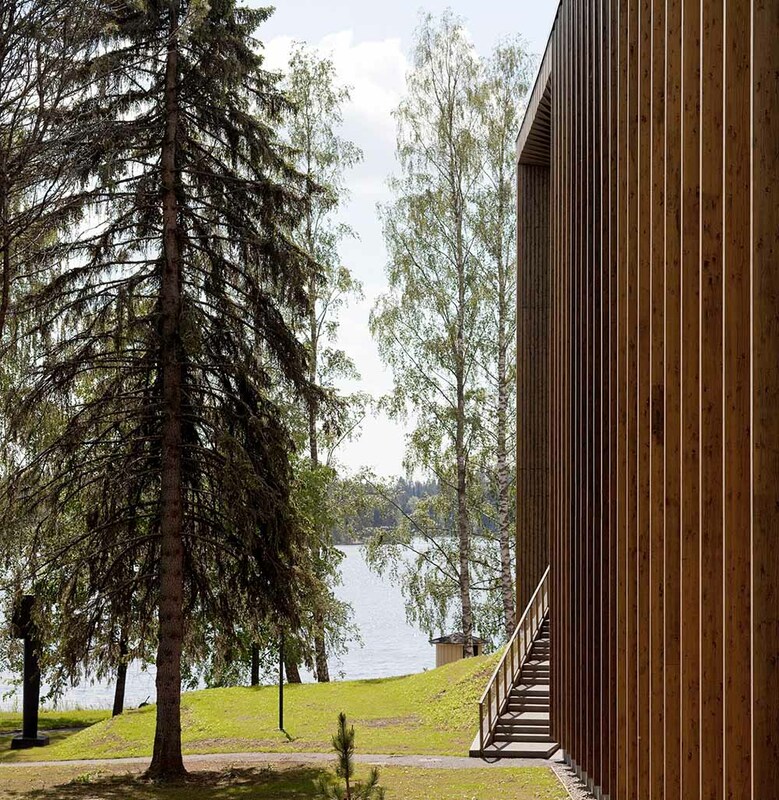 Technically, this project represents one of the first examples of large-scale public buildings in Finland to have been built with structures, external walls and finishes in wood. 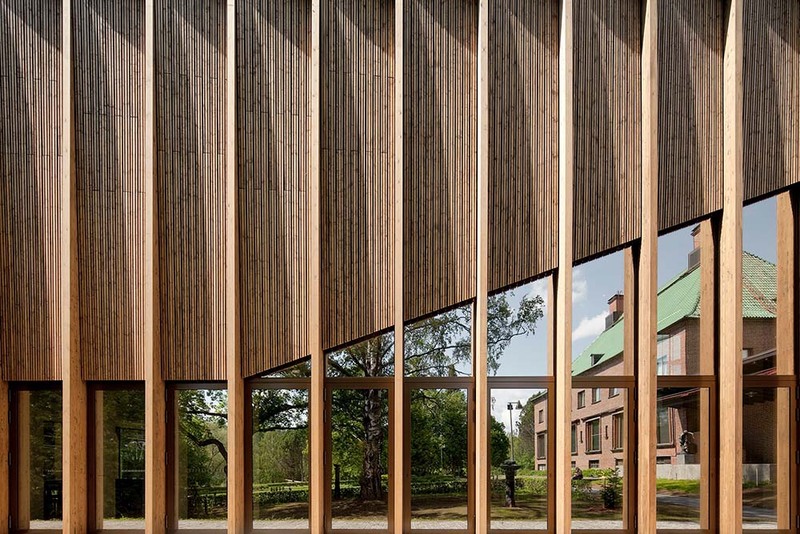 Despite the strict fire regulations, it was possible to leave the structural wooden frames visible inside the entire building. It was important to avoid covering the structure to perceive the smooth texture of the material and the curved surface of the ceiling accentuated by the steady rhythm of the beams. 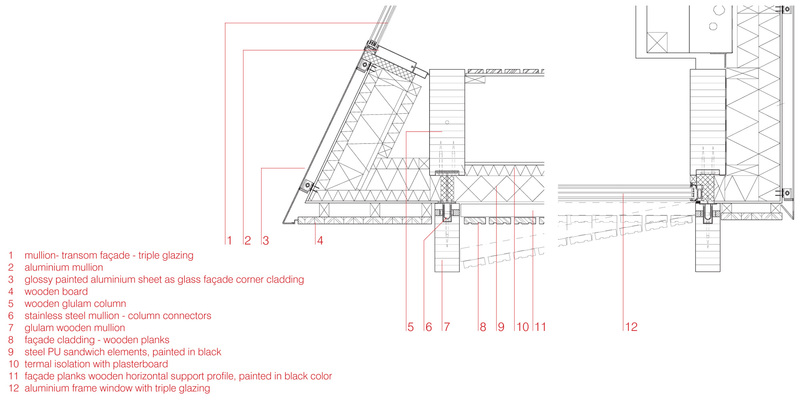 This structure was also designed to give greater flexibility to the interior spaces when planning future exhibitions. works of art which can even be hung from the roof beams. 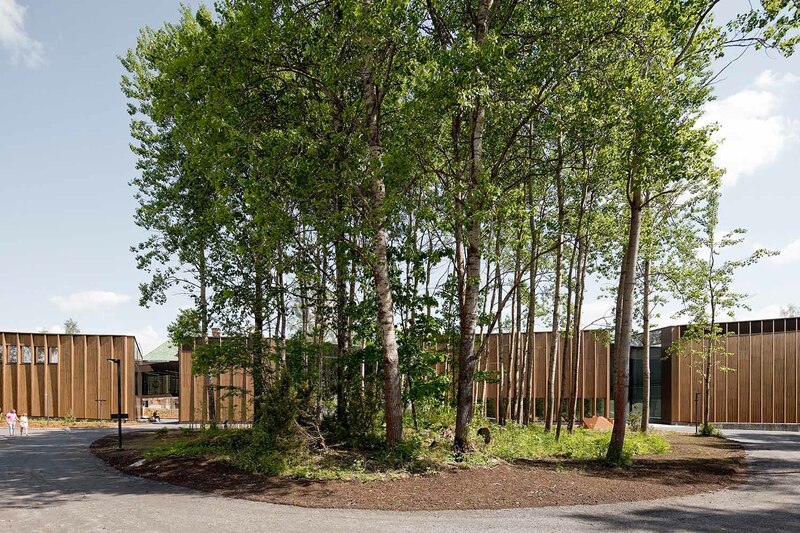 As the park became part of the journey for the senses and the museum visitor experience, the project also began to take on part of the outside on a larger scale. 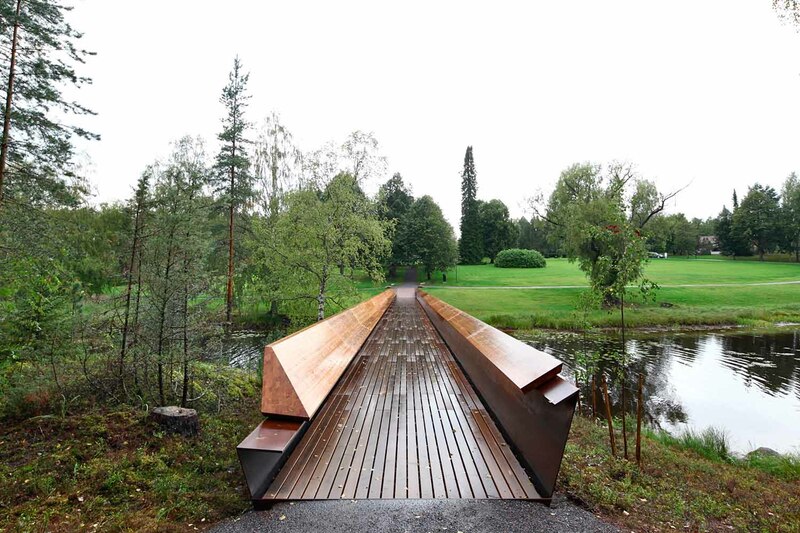 New parkland areas were renovated and introduced, the bridge connecting the park with the island Taavetinsaari was designed and new elements of art were also positioned in the landscape. 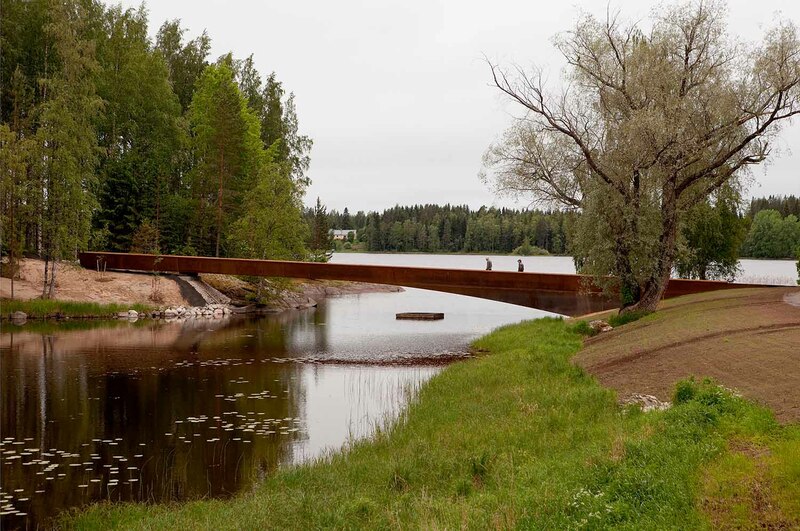 Once the expansion of the Gösta Museum and landscape intervention in the park located on the shores of Lake Melasjärvi had begun, the opportunity arose to connect this park with the small island of Taavetinsaari located in the southeast area of the park. 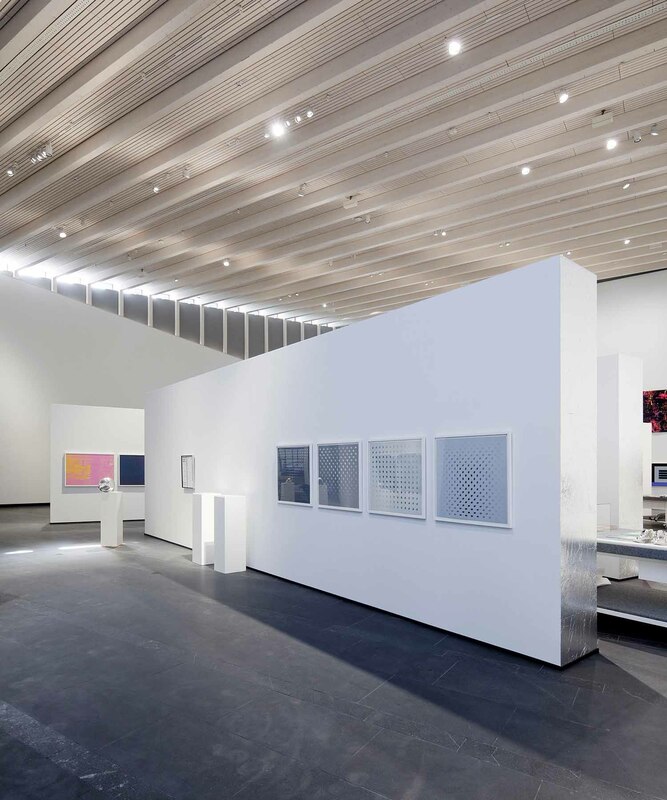 Formerly there had been a wooden bridge connecting these two points, but it collapsed a few decades ago, so it was necessary to respond to the need to integrate the island as an outdoor exhibition space and therefore complete the layout of the Museum of Contemporary Art. The new bridge has been placed in the same place occupied by the defunct walkway, at the end of the diagonal axis connecting the island with the Joenniemi Manor House. To achieve integration in the landscape, the way that infrastructure touched the ground at both ends was carefully studied. The lake shore of the island is relatively higher than the shore side of the park, which has a smooth, descending terrain. 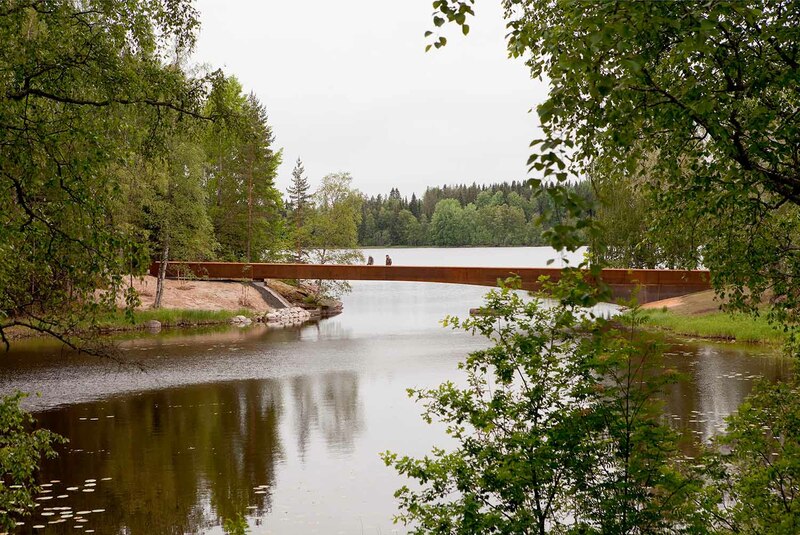 To overcome the height difference and accentuate topographic features of the site, the bridge has been placed with a slight slope, emerging from the earth on the side of the park and perched lightly on the island terrain. 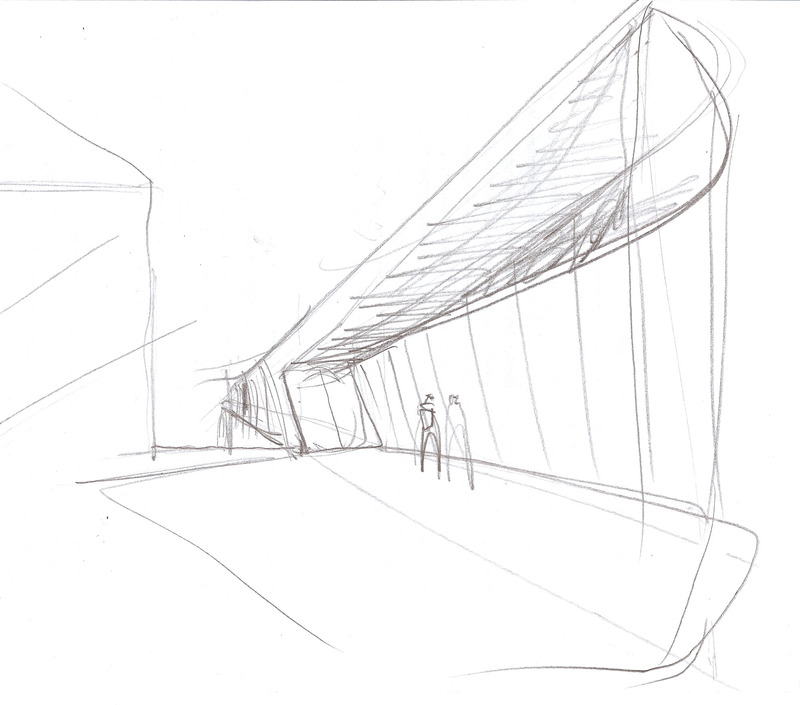 The geometry of the bridge, in addition to seeking the landscape integration, is a direct result of efficient structural design. The section of the bridge changes in its longitudinal part, being thicker at the base rising from the ground and thinner in the part that simply settles on the island. It also features a balustrade on one side and a bench on the other. 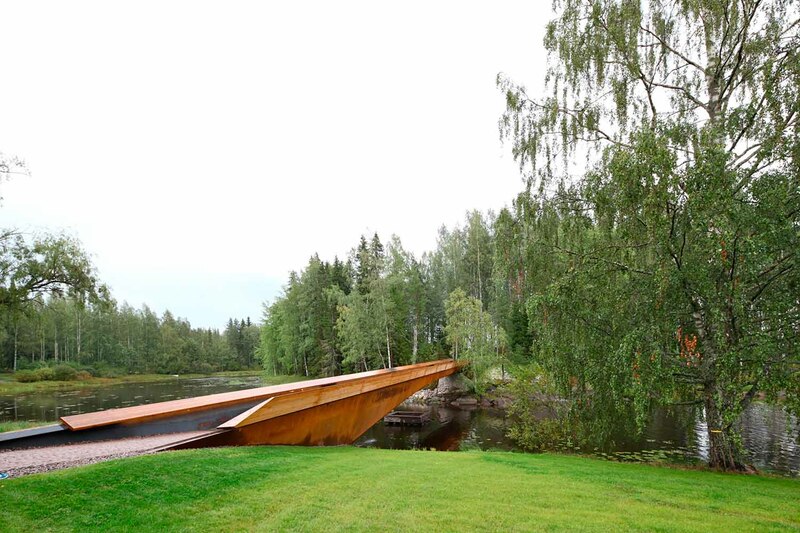 The sides of the “balustrade-bench” have been designed in larch wood along its course at two different heights. The lower bench was fabricated by a three-dimensional carved balustrade allowing it to move into the centre of the bridge to comfortably accommodate a group of visitors who wish to sit and stop to look at the landscape.